Blue Bottle Mystery is not just a solid exercise in taking an already successful work and re-imagining it for a new readership but also an object lesson in how to adapt material in a way that makes full use of the exclusive storytelling potential of the comics form. 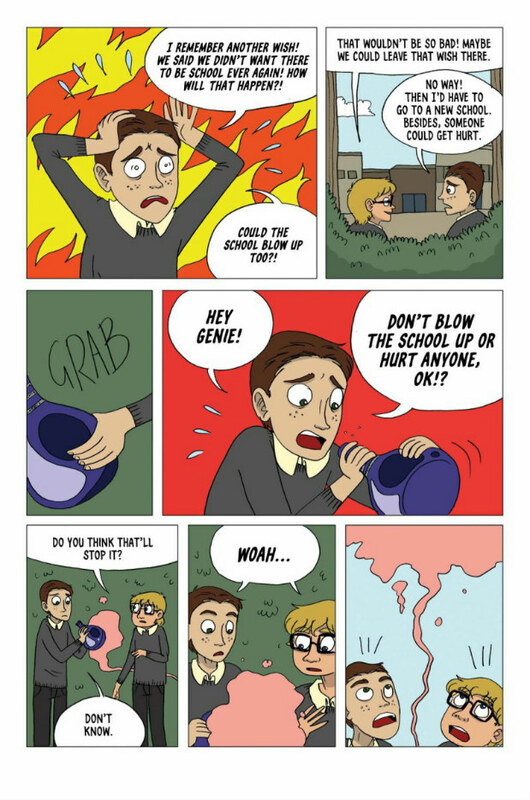 Over the last several years, the graphic medicine strand of comics has played a major part in the growth of the popularity of the graphic memoir; itself arguably of great significance in taking comics to a non-traditional readership. 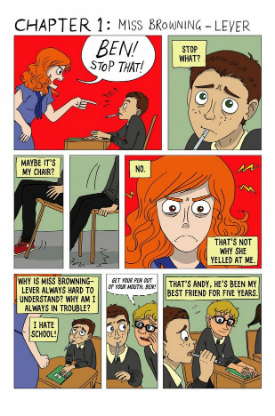 Last year Singing Dragon Books, an imprint of Jessica Kingsley Publishers, began a programme of publishing that has opened up the possibilities of comics as a communicative tool in the graphic medicine arena by producing work that goes beyond autobiographical accounts of health-related issues. 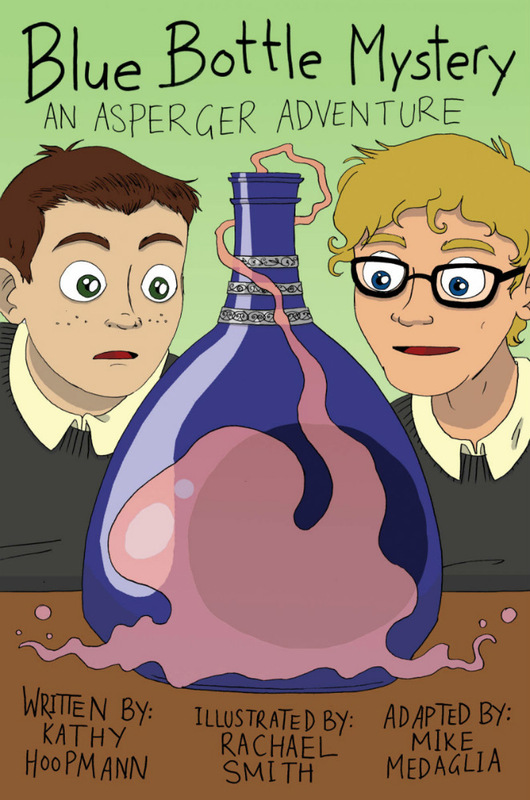 One such publication is Blue Bottle Mystery: An Asperger Adventure, a comics version of Kathy Hoopmann’s children’s book featuring a young protagonist with Asperger syndrome. The story has been adapted by Mike Medaglia (One Year Wiser), who has been featured frequently in our ‘Small Pressganged’ column over the last few years, with another regular BF spotlighted creator and British Comic Awards nominee Rachael Smith (The Rabbit) on the art duties. When approaching a review of material that is making a transition from an alternative medium to comics it’s important to ask not just whether the work has been effectively translated from its source but also the degree to which the unique properties of the latter form have been utilised to enhance and explore the themes of the original. 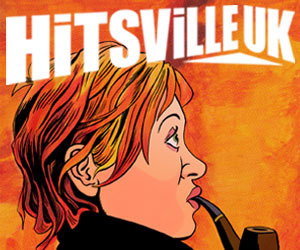 What Medaglia and Smith present here is a carefully faithful retelling of the original but, as one would expect from two such noted names on the UK indie scene over the last couple of years, it’s also one that keenly exploits the possibilities of sequential art to bring an added layer of understanding to Ben’s daily struggle to come to terms with the world around him. Just take a look at the use of lettering and speech balloons in the above image, for example, as they surround and oppress Ben, underlining his difficulties in relating to others and understanding the social inflections of day-to-day interpersonal interactions. These are the sort of playful uses of the standards of comics that Medaglia and Smith employ throughout to ensure that their interpretation of Blue Bottle Mystery takes full advantage of the medium. 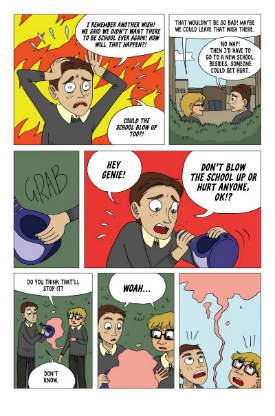 Similarly, diagrammatic layouts in an early sequence provide a panel-based realisation of Ben’s meticulous, Asperger-influenced approach to a task, and the skilful placement of visual metaphor is ingenious in bringing the reader into his daily experiences – check out the image below for an example. Never a simple substitute for Hoopmann’s book, Medaglia and Smith’s approach to bringing Blue Bottle Mystery to the comic page is, rather, a complementary version of its source material. Whereas Hoopmann was so adept at taking us into Ben’s mind by letting us see his environment through his thought processes, the comics adaptation allows the reader to also become an observer to a greater degree, and to witness the reactions of those around Ben to his perceived idiosyncrasies on a different level altogether. The sense of a character trapped in a reality he can never fully comprehend remains undiminished though. Rachael Smith is an inspired choice of illustrator for a project like this. There’s an accessible clarity to her cartooning style but one that is nonetheless highly expressive, especially in terms of visual characterisation, as we have seen on many occasions in the past in comics like I Am Fire, House Party and The Rabbit. She has that ability to fully convey a character’s moods, frustrations and emotions with just one unforgettable look or notable moment of demonstrative body language. It’s a pitch perfect approach in a story where nuance is everything in making that vital connection with younger readers and allowing them to form a fuller understanding of subject matter that may initially confuse or confound. Medaglia’s adaptation is well-paced throughout with a rhythmic flow to it, and the retention of the original chapter breaks ensure that a younger reader can dip into the book in an episodic fashion. Blue Bottle Mystery’s greatest triumph is that it explains Asperger’s without heavy-handed or dry medical exposition. We’re invited into Ben’s world to experience it first hand as he does rather than having it clumsily explained to us, and when there is a need for longer passages dealing with the causes of the syndrome they are introduced organically into the story within the natural course of conversation. It’s perhaps a small point in the overarching picture, given Hoopmann’s book’s success in its primary aim, but the glossing over of the nature of the supernatural elements that are such an integral part of the narrative in terms of either explanation or elaboration may be unsatisfying even to a younger reader. The central message of discovery, recognition and acknowledgment, though, is beautifully imparted throughout, as not just Ben but also his family and supporting players all come to terms with what Asperger syndrome means for him. Blue Bottle Mystery is not just a solid exercise in taking an already successful work and re-imagining it for a new readership but also an object lesson in how to adapt material in a way that makes full use of the exclusive storytelling potential of the comics form. We need to see far more graphic medicine aimed at a younger readership like this that never patronises its target audience but informs and elucidates through the remarkable communicative power of sequential art. Kathy Hoopmann (W), Mike Medaglia (Adaptation) and Rachael Smith (A) Singing Dragon, £12.99, November 2015. The Singing Dragon launch is at London’s Gosh! 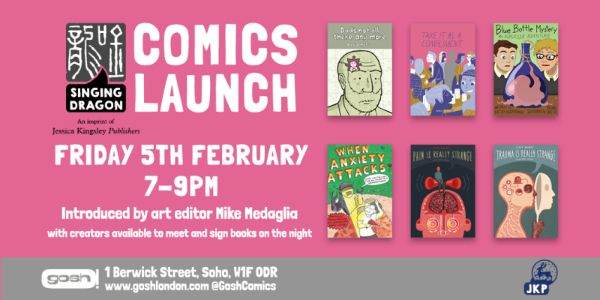 Comics this Friday February 5th. Details below.